During the brief interview snippets included with the Blu-ray release of the weirdly gratuitous and politically lazy thriller Killing Season, John Travolta discusses the film as a metaphor for war. He notes that his Serbian torture expert of a character—Emil Kovac—is actually quite similar to Benjamin Ford (Robert De Niro), the former American soldier he hunts down at a remote cabin in the Appalachians. Both men uphold generalized values about honour in battle, also having a sense of identity closely infused with their respective nationalistic make-up. Ford, a man weighed down by the horrors of the Bosnian conflict where he shot many Serbian prisoners after NATO intervened, is unable to let go of the past. He avoids tender familial relations with his son (Milo Ventimiglia), instead retreating to the wilderness where he lives a life ostensibly by the land. Kovac also lives in the past, travelling all the way to America to settle some lethargically defined past score, positioning himself as a friend to his target before engaging him in a one-on-one battle in the wilderness, characterized mainly by speechifying and protracted capture scenarios. 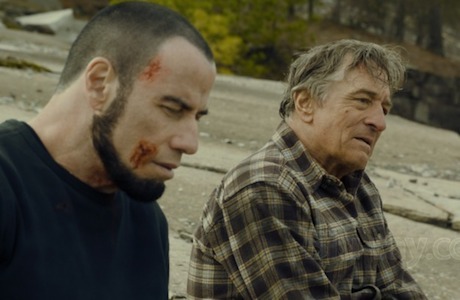 Moving past the inherent amusement of the set-up—Travolta's Serbian accent and erroneous Muslim beard are at least more consistent that De Niro's sporadic southern drawl—the execution of conflict has moderate visceral effect. After the duo have a dinner together where they blandly discuss that nature of honour and male posturing during times of war, the daytime action personifying these theories has some genuine tension, competently framing action with spatial awareness and the appropriate build-up towards bursts of intense violence. Presumably, in a bid to reiterate the grotesquery and inherently arbitrary, frivolous nature of settling differences through violence, Killing Season spends most of its time depicting torture. Both men are subject to nasty bouts of pain, being shot in the leg and face, respectively, with an arrow before having the wounds mutilated further through creative acts of human suffrage. While the idea is to make this bit of man-on-man action represent the Bosnian War and its notorious horrors metaphorically, it comes off as little more than puerile sensationalizing, forcing dramaticized reaction through graphic bloodletting to compensate for a flimsy set-up and superficial characterizations. Exacerbating this well-intentioned but misguided anti-war dramaturgy is the fact that the notions of war presented are generalized. Though facile and altogether banal, the absurdist instigators of violent conflict between the two (an inability to reconcile the past and a false sense of ego deflection in relation to identity) are entirely valid notions of bigger picture world conflict. But in making the backdrop the Bosnian conflict, the weight of specificity and political posturing (what does it mean that the villain, of sorts, is Serbian?) looms over the film, associating its cat and mouse histrionics with a war still fresh in the memory of many living people around the world.